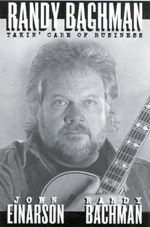 Randy Bachman of Saltspring Island is the former lead guitarist and songwriter for Guess Who, a Winnipeg-based group that had numerous hit songs including These Eyes, Shakin' All Over, Laughing and American Woman between 1965 and 1970. In 1972, he changed the name of his post-Guess Who band called Brave Belt to Bachman-Turner Overdrive, moved to Vancouver, and enjoyed a string of mega-hits in the 1970s, including Takin' Care of Business, Roll On Down the Highway and You Ain't Seen Nothing Yet. With rock music historian John Einarson he co-wrote his autobiography, Takin' Care of Business (McArthur & Company, 2000). The title refers to BTO's best-known song as well as Bachman's own shrewdness as a longtime survivor in the pop music industry. The memoir traces his career from his early days in Winnipeg with the likes of jazz guitarist Lenny Breau and rocker Neil Young to a coast-to-coast reunion tour with the Guess Who in the summer of 2000. Prior to moving to Salt Spring Island, Bachman, a Mormon, lived in White Rock. Born in 1970, his son Talmage 'Tal' Bachman has also pursued a career in pop music. The veteran rocker gathered more of his musical memoirs for Randy Bachman's Vinyl Tap Stories (Penguin 2011), a spinoff from his CBC Radio program that has attracted up to 850,000 listeners per week. Its follow-up called Tales from Beyond the Tap (Viking 2014) is touted as Randy Bachman unplugged, a collection of music business recollections from his thousands of gigs over a fifty-year career that has earned him 120 gold and platinum album/singles awards around the world. He can be forgiven for writing American Woman because he wrote These Eyes. He avoided classic rock star burnout partly because he was a Mormon. He has hobnobbed with pop music royalty but remains level-headed. Now veteran guitarist and Salt Spring Islander Randy Bachman has gathered more of his musical memoirs for Randy Bachman's Vinyl Tap Stories (Penguin $32), a spinoff from his CBC Radio program. His previous memoir was Takin' Care of Business (McArthur 2000).